A grower purchases 3 seeds of the same strain, and 2 of the plants are doing great, but one is struggling. For some reason even though it's getting the exact same environment, it's still growing slower than the others. Why is one cannabis seedling is staying smaller than the others of the same strain in the same environment? Why are two plants growing rapidly, while the third plant is growing slowly even though it looks healthy? Seeds Are Old – Seeds that are old tend to have lower germination rates and sometimes grow at a slower pace. More Sensitive to Overwatering – One of the most common reasons seedlings grow slow is they are overwatered. This is often accompanied by general droopiness. Some plants simply drink more than others, and the amount of water that's good for one plant may be too much for another plant. 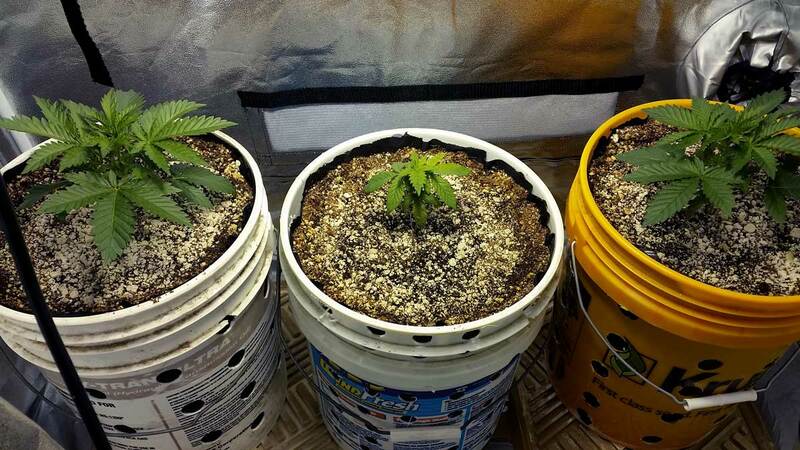 When one seedling is growing slower, watch it closely to see if it may be getting droopy after you water your plants. PH is Off – The pH at the roots being too high or too low is the most common reason growers see deficiencies, but it can also slow down growth even if you don't have any obvious symptoms. If you haven't been checking the pH, do it now to see if that might be the root of your problem! It's possible the pH at the roots is not the same for all your plants even though they are in the same conditions and environment! Some Plants Are Just Runts – The fact of the matter is that cannabis plants are living things with natural variation between plants and sometimes it has nothing to do with you! Some plants just tend to grow better than others, while others are runts or duds right from the beginning. In fact, that's why we recommend to always start more seeds than you plan to grow, so you can choose the strongest and most vibrant plants of the bunch to actually grow out! If you've covered all your bases, the best thing you can do is either toss the offending plants if you don't have extra room, or if you do have the space it can be worth growing it out to see what happens! Some plants may not recover, but some plants start growing strong again after they get a little TLC!